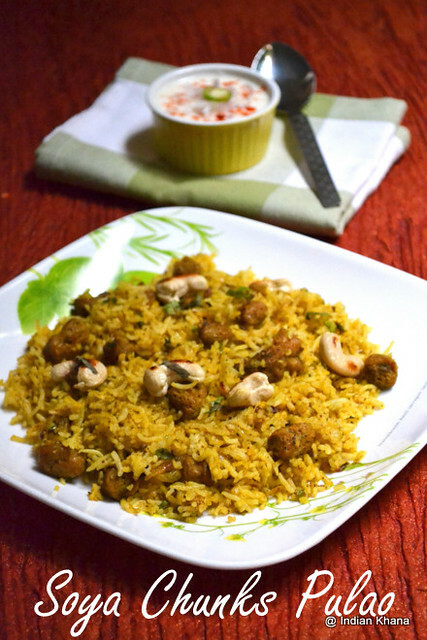 This Soya Chunks or Mealmaker Pulao is somewhere near to the Soya Chunks Biryani I posted, but this recipe takes less time and can be done in jiffy if we have cooked rice in hand, also a very good way to use leftover rice. 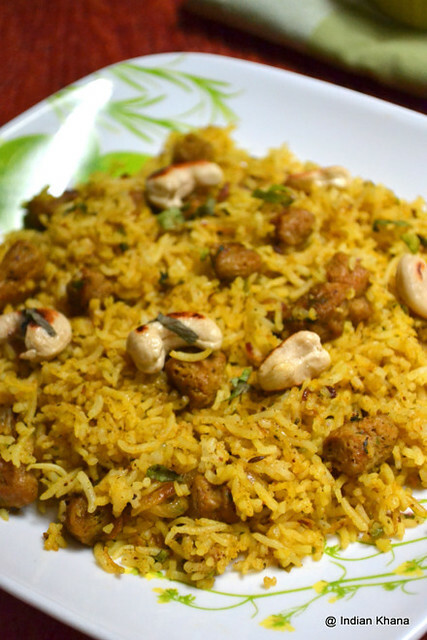 I was getting bored of same soya chunks biryani so one day I tried this recipe and now I make this often. Perfect for lunch box or even for a party, pair up with a simple raita and that’s all it makes a delicious meal. You can also add any other vegetable of you choice like peas, carrot, potato, capsicum etc to make this simple pulao even more interesting. I missed to take step-vise pictures, I will try to update it again sometime. 1. Cook and spread rice in plate to cool down. Pressure cook soya chunks for 2 whistles or microwave for 4 minutes or cook in boiling water for 6-7 with little salt, squeeze excess water and keep side. 2. Grind all the ingredients in smooth paste, use 1-2 tbsp of water only if required. 3. In a pan or wok heat oil add cumin, fennel seeds and allow to splutter, add cashews and fry until light brown. 4. Add onion and sauté until translucent, add grinded paste and sauté for 2-3 minutes until raw smells goes. 5. Add soya and mix well, now add chili, turmeric and salt and mix well sauté for 3-4 minutes. 6. Add rice, garam masala and mix everything well, garnish with cilantro and off flame. ~ If using leftover rice then mix rice and sauté for 4-5 minutes. Serve warm with your choice of raita. Looks delicious..I make soya chunks rice too, slightly different recipe.. Sounds easy and looks delicious too. 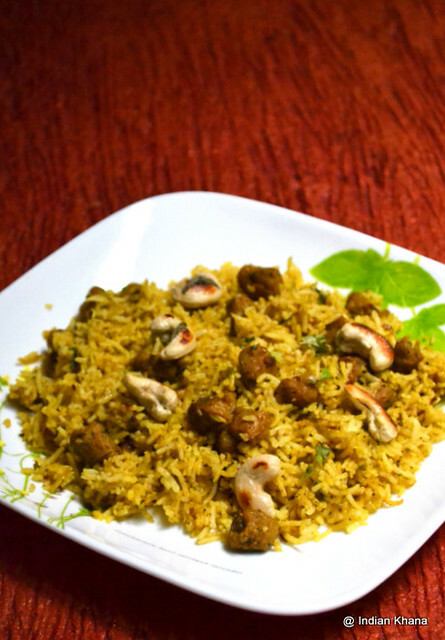 Very healthy and delicious pulao. Soya is my fav. soya pulao looks so healthy. it makes me hungry. 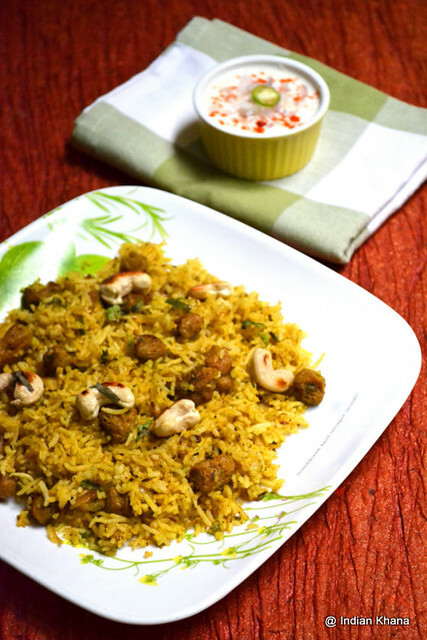 healthy pulao with lots of protein..
soya chunk pulao looks delicious. 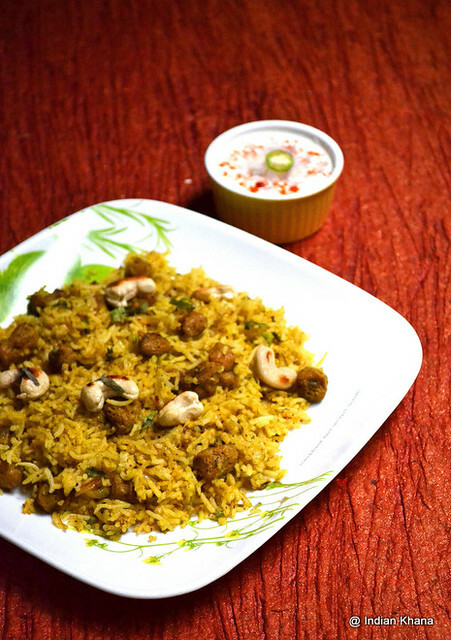 Looks delicious and healthy pulao. Excellent presentation. Lipsmacking good pulao......mouthwatering here. Can have some right now! !